UPDATE: Charleston law enforcement authorities have confirmed that the website containing Dylann Storm Roof's manifesto and photos was registered and run by Roof. 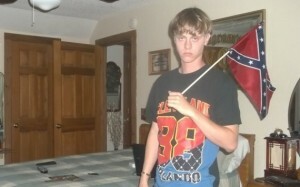 A photo of Dylann Roof taken from what appears to be his personal website. A manifesto, purportedly penned by Dylann Storm Roof, the man charged with murdering nine people at a historic black church in Charleston, S.C., has surfaced online. A website contains numerous photos of Roof as well as a 2,000 word manifesto. The website is called “The Last Rhodesian” – the Rhodesian flag was one of the patches Roof had on his jacket in his Facebook profile photo. Roof’s manifesto reveals much of his motivations for committing his heinous act. In it, he specifically cites the website of the white nationalist hate group Council of Conservative Citizens (CCC) as his gateway into the radical right. The CCC is the modern reincarnation of the old White Citizens Councils, which were formed in the 1950s and 1960s to battle school desegregation in the South. Today, the CCC dedicates itself to educating whites on what it sees as an epidemic of black on white crime in the United States. The CCC website has been a touchstone for the radical right to get “educated” on this issue – and it appears this was the first stop for Roof on his dive down the white nationalist rabbit hole. The CCC is very active in Roof’s home state of South Carolina. In fact, the CCC webmaster, white nationalist Kyle Rogers, is based in the state. Rogers is the mastermind behind the CCC’s push to bring attention to black on white crime – writing article after article on the CCC website exposing what he calls black on white hate crimes. This brand of racist opportunism, exemplified by Rogers’s coverage of the Trayvon Martin shooting, is a staple of Rogers and the CCC’s media plan. On Feb. 6, 2012, in the midst of the site’s coverage of the shooting, the CCC’s website topped 170,000 unique visits in a single day. Such successes have emboldened Rogers and the CCC’s web team, resulting in similar coverage following the 2014 death of Michael Brown in Ferguson, Mo., and the social unrest that followed. It seems the CCC media strategy was successful in recruiting Roof into the radical right. When he isn’t writing about black on white crime, Rogers manages a flag store, Patriotic-Flags.com, which you can visit by clicking an ad on the CCC website. Rogers’ store sells the flag of the government of Rhodesia, the same flag sewn on the jacket worn by Roof in his Facebook profile. Before Roof’s alleged manifest was discovered, Rogers was quick to attack the Southern Poverty Law Center for our reporting on the Roof shooting. Rogers claimed “there is no evidence whatsoever” of Roof being radicalized online. If authorities determine that Roof’s manifesto is authentic, Rogers words may well come back to haunt him.